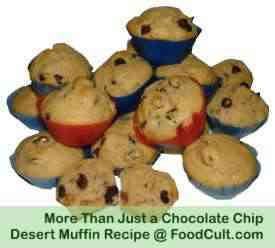 More Than Just Chocolate Chip Dessert Muffins! In one bowl (the larger of the two) blend, fully, all dry ingredients. In the second bowl fully blend all wet ingredients. Preheat the oven to 375oF (190oC). Pour the blended wet ingredients over the blended dry ingredients and fold in mixing only enough to wet the dry ingredients. Bake muffins on the middle shelf of a fully pre-heated (hot) oven for 17 to 25 minutes (depending upon the size of the muffin cups and the material - metal "may" take a little longer). Test for doneness with a toothpick. About "toothpick" testing for doneness: Insert the toothpick into the center of the muffin. (we keep a piece of a bamboo skewer to test our loaves.) If the toothpick comes out wet return these quick breads or muffins to the oven for 2 to 4 minutes. You may see some grains sticking to the toothpick. If they are dry your baking is done - some sticking, of cooked dough, to the toothpick is normal. If (batter-like) wet bits stick to the toothpick continue baking. In our home these muffins were known as "Bub's Muffins" because Bubbie was the one who made them all the time. She'd been making those since the 1930's. They always came out a little different - she had no structured recipe. Sometimes they were a bit dark, sometimes a little hard, sometimes this and sometimes that but we always loved them. Bub's muffins always had chocolate chips and walnuts and the walnuts were always freshely cracked. Raisins were almost always included. Their absence only meant that she had none left ... but there was still demand for these tasty treats. Her muffins were made with milk - all the time. We, now, use soy milk which means, if you are a devout Jew, they can be prepared pareve (may be eaten with a milk or meat meal). We are not so devout and would eat them all the time regardless of what is on the menu. We just think soy milk, since it is fat-free may be a better choice (at least sometimes). We have not tested this recipe with almond or rice milk. One day we decided we wanted to save her recipe. She was already in her 80's and while we loved her, we also loved her muffins so we probed ... "Oh, put in some of this and some of that. Put in some eggs..."
"A few. You know ... some eggs." Was the answer. We were quickly realizing why her recipe was inconsistent. She called for 1/4 teaspoon of cinnamon and my 1/4 measuring spoon said, "Do not use with cinnamon." Well, not really but 1/4 teaspoon of cinnamon in a recipe that size made no sense to me. After more than an hour of probing we were able to narrow down real quantities. We went home and tried and refined the recipe ... and tested and tasted. We swapped some of the vanilla for almond extract and reduced the sugar). We experimented! Then one day we took some over to her home and she tasted one and said, "Yours are better than mine." For many years we got lazy and went back to the original recipe - making them in the same pans with the same ingredients as she used and they were great but recently, we started testing and tasting again ... and this is where we started using soy milk (even though milk yields a slightly richer taste and texture) and started putting almond extract back in. They're not exactly the same and every now and again we'll revert to the original recipe but the new, lighter muffin is still a great piece of nostalgia for us. It is, after all, still "Bub's Muffins". Bub had several muffin pans ... minis and standard sized (although they were of different standard sizes). She even had a couple of madelines pan ... and she used them all. Any time she made these muffins, she would pull out any pan she had handy so a batch of muffins (sometimes refered to as "cookies") could come out with any number of shapes. Sometimes she would use paper liners. Most of us hated them. Grease them though she may, the paper tended to stick and most of us complained but, sometimes, she wanted to make her own life a little better by making clean-up a little easier so she used the paper. Today we think she would just love silicone. No more paper muffin liners - no more complaints about paper liners - no more greasing - easy clean-ups. We debated on how they should be named. We thought, maybe, "Everything Including the Kitchen Sink Muffins", or "It's Got it All Muffins". What it really is, though, is a "More Than Just a Chocolate Chip Dessert Muffin". ...And now that you know the history of these dessert muffins.